Historic, vibrant, and eclectic, King Street has been enhanced by active planning and implementation through its evolution from an 18th century colonial seaport and 19th century center of trade to a center of 21st century commerce and tourism. 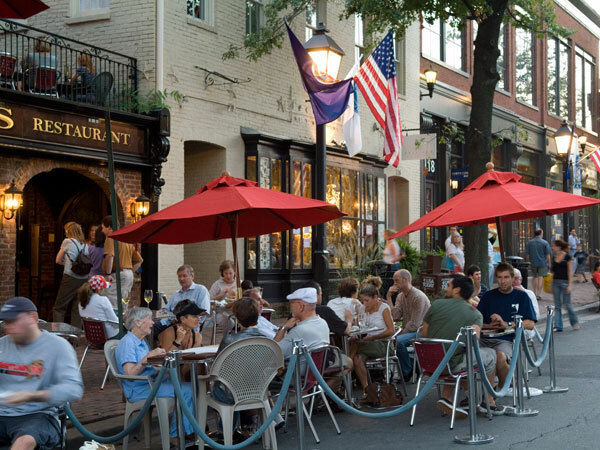 Planning and preservation have ensured that King Street, part of the "Old and Historic District" in Alexandria's "Old Town" neighborhood, balances the past with the present. The city's Archeological Protection Code, adopted in 1989, requires impact assessments on cultural resources for new development and a Board of Architectural Review ensures that designs for new construction and exterior alterations blend with the street's historic buildings. Twenty blocks between the Potomac River to the east and the King Street Metrorail Station to the west. 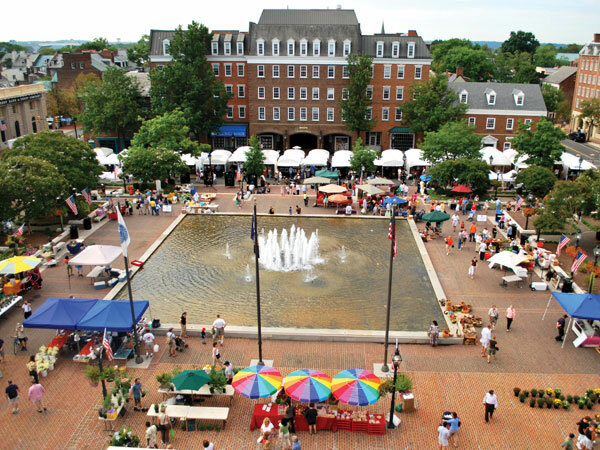 Surrounded by 18th and 19th century buildings, King Street's preserved Market Square hosts one of the nation's oldest continuously operating farmers markets, along with festivals and other events. Photo courtesy of Alexandria Convention and Visitors Association. Approval of special zoning in 2005 and 2007 encouraged a mix of businesses and outdoor dining, which help foster activity along the street and prevent concentrations of any one type of business. At the western end of King Street, beyond the historic district, is a Metrorail station built in 1983. While this part of the street has a larger scale, a 1992 plan led to redevelopment from low-scale warehouses, an auto dealership, and surface parking to offices, hotels, restaurants, and infill commercial development. The resulting transition area, with moderate building height restrictions and a wayfinding system installed in 2008, guides visitors to Old Town by foot or a free trolley service. 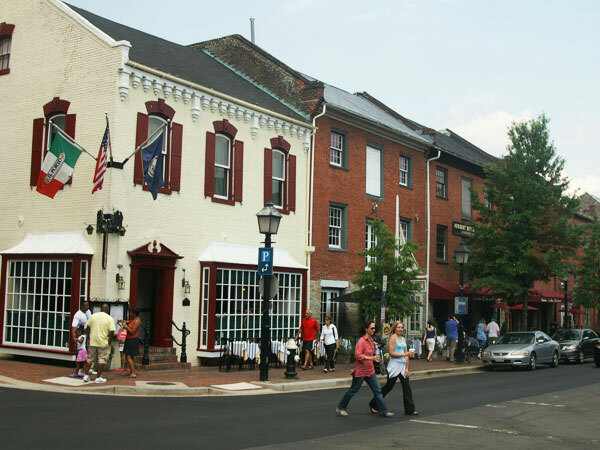 With its attractive mix of dining, retail, and other attractions for residents and visitors alike, King Street continues as an economic center and gathering place for the City of Alexandria – a role it has served since George Washington drew early plats for the street in 1749. Outdoor diners, furry friends included, enjoy their meals al fresco, as a result of the King Street Outdoor Dining Overlay Zone encouraging such use. Wide sidewalks allow for pedestrian movement, and old-fashioned street lamps line the streets, setting the mood for a pleasant evening outside. Photo courtesy of Alexandria Convention and Visitors Association. King Street Retail Zone (2005) provides regulatory flexibility that encourages a balance of retail, residential, and commercial uses yet ensures King Street feels and functions as a downtown "Main Street"
Free King Street Trolley provides service between Metro Station and waterfront every 15 minutes from 11:30 a.m. to 10:15 p.m. The oldest section of King Street is dominated by 18th to 20th century architecture, typically constructed of brick and two to three stories high. Portions of the street were listed as part of a historic district in the National Register of Historic Places. This section of the street is commonly referred to as Old Town. Photo courtesy of Nathan Macek.